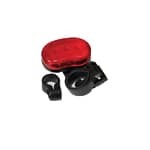 The Flashing Safety Light mounts anywhere on your chair’s frame and flashes with a red light. This draws attention to you when enjoying time outdoors at dusk. Be Safe on all of your adventures.